UTS Science in Focus: Biohacking–why should we care? Get insights into biohacking, novel applications produced and how it can serve as a useful education tool. 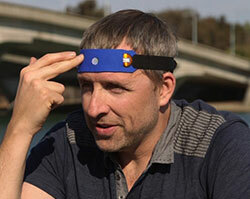 Biohacker Dave Asprey demonstrates a headband that he claims electrically stimulates blood to reach the front of the brain to improve cognition. Photo by Jason Lelchuk, extracted from PBS Newshour. Over 50 cities mostly in America and Europe are now home to groups of biohackers or DIY amateur laboratories where ‘every day’ people meet and tinker with science and technology. Well-known hackerspace include Genspace in New York, BioCurious in the Silicon Valley and La Paillasse in Paris. These groups of science explorers and risk takers are trying to create a range of novel things, such as an ink from bacteria, and vegan cheese by transferring casein genes into yeast. So, what is biohacking? How is it changing the world? Should we be concerned about safety? Could these labs create killer bugs or be a training ground for bio terrorists? Can these DIY labs ferment a revolution? What are the opportunities? Can it create a culture of start-ups and entrepreneurs? In this talk, Dr Ellen Jorgensen, co-founder and director of Genspace will provide insights into biohacking, novel applications produced and how it can serve as a useful education tool. The talk will be followed by an expert panel discussion with Professor Peter Ralph, Dr Sheila Donnelly and Professor Michael Wallach, who will facilitate the discussion. Dr Ellen Jorgensen is co-founder and director of Genspace, a non-profit community laboratory dedicated to promoting citizen science and access to biotechnology. In 2011 she initiated Genspace’s award-winning curriculum of informal science education for adults, and in 2014 Genspace was named one of the World's Top 10 Innovative Companies in Education by Fast Company magazine. Ellen's efforts to develop Genspace into a haven for entrepreneurship, innovation and citizen science have been chronicled by Nature Medicine, Science, Discover Magazine, Wired, Make, BBC News, The Economist, Forbes, PBS News Hour, The Discovery Channel, and The New York Times. Ellen has a Ph.D. in Molecular Biology from New York University, spent 30 years in the biotech industry, and is currently adjunct faculty at New York Medical College, the School of Visual Arts, and Cooper Union. Ellen’s talk ‘Biohacking- you can do it, too’ at TEDGlobal 2012 has received over a million views. © Copyright UTS - CRICOS Provider No: 00099F - 24 January 2019 03:12 PM. The page is authorised by Deputy Vice-Chancellor and Vice-President (Corporate Services).